If you are near the Auburn, CA area and have an automobile in need of Air Conditioning Service – you have arrived at the right place! 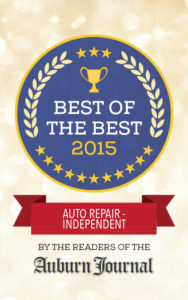 Master Technicians, located in Auburn, has ASE Certified Master Mechanics on staff, who will provide you with an honest and professional assessment of your car’s A/C system and provide service or repair as needed. One of the many components which make-up an automotive A/C system and require routine inspection for leaks include the A/C condenser. We can also perform an A/C Leak-Test to determine if the system is leaking refrigerant and reducing the performance of your vehicle’s A/C. Many people think that your A/C is not used in the winter and this is simply not true. Your A/C system is an integral part of your defroster system as well. The A/C system helps to pull moisture out of the air. This is the same moisture that ends up fogging your windows. Contact us to schedule an appointment for your A/C!